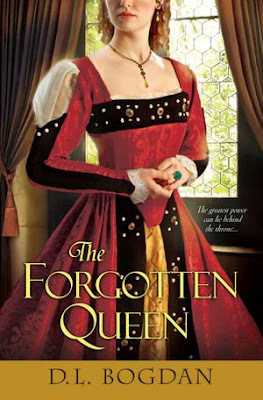 The Broke and the Bookish : Kelly's review of The Forgotten Queen by D.L. Bogdan + giveaway! Kelly's review of The Forgotten Queen by D.L. Bogdan + giveaway! "From her earliest days, Margaret Tudor knows she will not have the luxury of choosing a husband. Her duty is to gain alliances for England. Barely out of girlhood, Margaret is married by proxy to James IV and travels to Edinburgh to become Queen of Scotland. Despite her doubts, Margaret falls under the spell of her adopted home. But while Jamie is an affectionate husband, he is not a faithful one. And nothing can guarantee Margaret’s safety when Jamie leads an army against her own brother, Henry VIII. In the wake of loss she falls prey to an ambitious earl and brings Scotland to the brink of anarchy. Beset by betrayal and secret alliances, Margaret has one aim—to preserve the crown of Scotland for her son, no matter what the cost…"
I was so excited to receive a book about Margaret Tudor! As the title suggests, she is often a forgotten historical character (she doesn't even exist on the TV show The Tudors!). There are plenty of books about her sister Mary and in books about her brother, Henry VIII, she may appear early on but quickly disappears, never to be mentioned again. It was wonderful to find a complete and lengthy book about her life....even if Margaret herself wasn't the most likable character. She is portrayed as very naive, selfish, and troubled. When Margaret is young and sent to Scotland to be married, she imagines herself as the savior that will unite Scotland and England through her power and sons. Even when none of that happens (at least in her lifetime) she is still under the impression that she is a great and mighty queen, all while the nobles of Scotland want nothing more than to see her gone. She also has the irritating quality of falling in love with every man she meets, or expecting that he is falling in love with her. This tendency leads to many problems (and many husbands). A lot of parallels were drawn to her granddaughter Mary, Queen of Scots (the husband troubles, alienation from her child, ineffective rule, her entire country upset with her, etc). Funnily enough, these two mostly disliked women, who never met, were the ones that would actually bring Scotland and England together. Slightly unlikeable queen aside, the story overall was very engaging, well-written, and informative (that last word sounds a bit boring, but it's true. I learned a lot and sometimes that's the best thing you can take from a book). Some of the side characters were the most interesting to read about. I especially liked Margaret's father and mother (Henry VII and Elizabeth of York, a couple who don't have nearly enough fiction written about them) and her African maid Ellen. We all know that Scots, especially historically speaking, are a crazy, eccentric bunch, and The Forgotten Queen is a wonderful little glimpse into that world! One of you has a chance to win a copy of this exciting new historical fiction release! This giveaway is open internationally and you have until February 3rd to enter. Simply leave a way to for me to contact you (email, Twitter, etc) in a comment below. Good luck! This novel really sounds like my kind of read . Thank you for the giveaway! Really excited about this book because I know next to nothing about Margaret. Thank you for this giveaway. This sounds like a wonderful book - I hope I get a chance to read it soon. I am so excited about this book! Thanks for the giveaway! It's been such a long time since I've read Tudor historical fiction. I'm not sure I know who Margaret was, but I'm interested in finding out! Thanks for the giveaway! It’s already been a long time since I went to it. you, a really delighted trip! This sounds like a great read. Thanks for offering giveaways! My email is cookiejarprincess@hotmail.com. thank you for the chance to win The Forgotten Queen!!! I enjoyed your review and look forward to reading this book. I'd like to be counted in for this one. Thanks for making it open to all. Much appreciated. Sounds like my kind of story! !